When our family started living frugally in 2007, our plan was predicated on certain real estate decisions that required us to sell our old house, buy a new house, and significantly cut our spending. Over the past five years, we have continued to approach frugality in an organic way–reacting and changing our behavior as necessary to our circumstances. Also, every six months we review our finances and our spending, always finding new ways to cut back. We’ve known for years that our daughters would be going to college. While some families believe that it is the student’s responsibility to pay for college, my husband and I are not of that belief system. Our parents figured out a way to pay for college, and we have always felt that we owed the same to our daughters. Like most parents we started saving for college when our daughters were born. But as a freelance writer and a graduate student–our careers when our girls came into the world–we simply didn’t earn enough money to really sock away the cash to pay for college. Last fall, we realized that we would have to start taking a new approach to our frugality–learning to live on one salary so we can pay for college. I realize that this isn’t new for a lot of you dealing with job losses or other family circumstances, but for anyone with a child approaching college age, it’s a reality that they should embrace. Why? Because if you live in a dual-earning household like we do, chances are you are going to be forking over all or a portion of one parent’s salary, in the form of tuition payments, at some time in the near future. So why not get used to it now and see how much money you can sock away to pay for college? You know how I’ve prided myself on being able to save my family money by using coupons when I grocery shop, being smart with our energy bills, and finding ways to bring in extra cash by consigning my clothes. I was even more determined to use all those tricks to pinch our pennies once we decided to start living on one salary–my husband’s. Every payment I got for my work, I deposited in a savings account. That money never entered our checking account, which meant that neither an ATM visit nor a debit card could touch that money. Without that money at our easy disposal, we left it alone. In no time we’d saved enough to pay for half a year of college–in just a half a year. Suddenly, we realized, that if the financial aid gods weren’t going to smile on us, paying for college might just be doable. So my takeaway to you is this: if you have a big financial goal for your future, like college, start banking your paychecks. If you both earn, then do what we did and choose the person whose salary is smaller and begin putting it right in the bank. If you live in a single-salary household, find a way to take a portion of that paycheck and start saving it. If you do this on a regular basis, you’ll be amazed at how fast that money can add up. 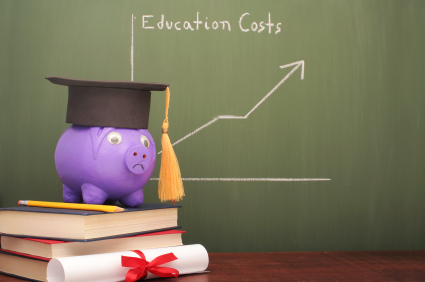 What are your tips for saving for college tuition? A great and easy way to save is bartering instead of tossing. I barter for clothes, DVDs, books, vacations, plane tickets, kitchen appliances, etc. At barterquest.com you can barter almost anything, including services and real estate. You have no idea how much money you will end up saving!